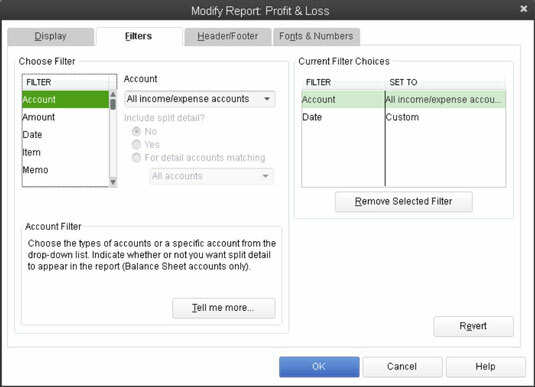 The Filters tab is probably the most interesting and useful tab provided by the Modify Report dialog box in QuickBooks 2013. The Filters tab enables you to set up filters that you can use to specify what information gets summarized in the report. To use the Filters tab, you first select the field on which you want to base a filter from the Filter list box. For example, if you want to filter information based on the account, select Account from the Filter list box. After you identify the piece of data on which you want to base your filter, open the drop-down list next to the filter. If you selected an account filter, for example, QuickBooks names this drop-down list the Account box. 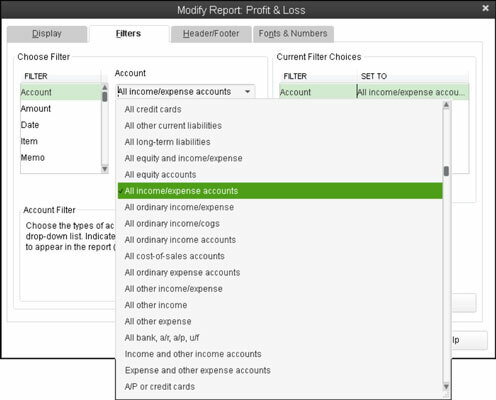 When you open the drop-down list, QuickBooks displays a set of filtering choices. For example, the common filtering choices available when you’re creating an account filter: are All Income/Expense Accounts, All Ordinary Income/Expense, All Ordinary Income/COGS, and so forth. You can pick a standard account filter from this list. Alternatively, you can pick, for example, the multiple accounts entry from the drop-down list. 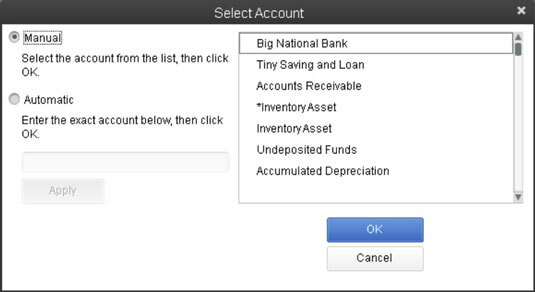 In this case, QuickBooks displays the Select Account dialog box. This dialog box lets you select, on an individual basis, which accounts you want to appear on the report. For example, if you want to create a report based purely on a checking account, an accounts receivable account, and an inventory asset account, you use the Select Account box to select these accounts. To select the accounts that you want, click them. QuickBooks identifies selected accounts with a check mark. Other fields and boxes on the Filters tab are probably pretty self-explanatory. The Include Split Detail? option buttons, available for account-based filters, let you tell QuickBooks whether it should include split transaction information. The Current Filter Choices list identifies what report filters are used for the report. You can remove a filter by selecting it from the Current Filter Choices list and then clicking the Remove Selected Filter button. You can also revert to the default filter by clicking the Revert button. Note that different boxes appear on the Filters tab for different filters.